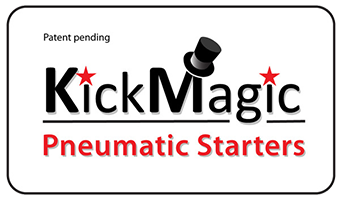 It takes a wide-ranging collection of talented and passionate individuals to envision, develop, test and deliver the KickMagic Triumph Pneumatic Starter-assist Kits. Jack Manning Overall Program Manager simultaneously wearing the hats of Systems Engineer, Sales & Marketing Director and CFO. Nick Woodbury Lead roles in Manufacturing Engineering, Fabrication, Sourcing/Vendors and mentoring an eager bunch of junior engineers. Yankee ingenuity personified. 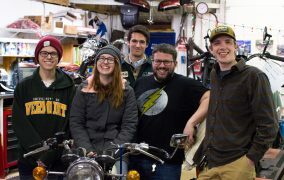 A great crew of young engineers from the University of Vermont. We had to keep remembering that they had to satisfy not only us, but a year long set of course requirements. We are pleased they have been successful on both fronts. Zach Centerbar was our principle point of contact and evolved as our lead mechanical designer with an eye for fit, form and function. It helped that his internship at a local firm allowed him the use of their SolidWorks CAD system. He was exceptional at taking all inputs – engineering, manufacturing and aesthetic – into consideration when designing. Very clever fellow and a vintage biker (1983 BMW R80) to boot! Brianna Weiss came to our first meeting riding also riding a motorcycle along with Zach. Good omen! She took advantage of her teaching assistant position in the “3D Lab” to bring us a constant stream of plastic parts from the 3D printing machine. HUGE help in visualizing what would work and what wouldn’t. Great eye for fit, form and function. Noah Briggs quietly took on a range tasks, one of which included “designing” a leather satchel with our colleague, Bill, the middle school art teacher noted below. Now, this is a fellow who has had an internship on nuclear subs with General Dynamics Electric Boat. Talk about one extreme to the other. But the result was clear definition to give to our vendors in a form they rarely see….and really appreciate. John Drew turned out to have some experience in his internship with packaging and designing electronics into tiny enclosures. It just so happened we needed one of those – he dashboard is his design and reflects upon that experience. He also took a keen interest in the provisional patent application process and generated a significant portion of that definition. Bryan Dooley led the effort to get us the believable data we needed. He created our instrumentation package and in the end we had incredibly accurate test data from pressure, to torque, to rotational speed, to allow us to make solid design decisions and really fine tune the system. Beyond that he took on the manuals and showed a natural affinity to articulate how everything fits together and present it in a simple and understandable fashion. Bill Nicolay and Brian Ferris The UVM team was laced with mechanical talent, but in the end we needed a control system, which meant electrical hardware and software talent – and these guys have it in spades. Bill was one of the first generation of Biotek engineers and is now retired. Brian is of the current generation. And, naturally, both are bikers. Their collaboration gave us a compact and robust control system that worked right out of the box and has the flexibility to be applied to future systems. Josh Baptiste Our ace in the hole on how to get KickMagic to production. 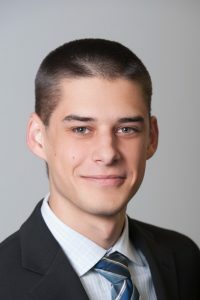 Josh is the sales engineer for Pearse-Bertram, our contract manufacturing partner. Nowhere will you find a more dedicated and energetic partner. Always had options and recommendations for us and no detail was too small. It just so happens he represents a great company that is a perfect fit for us. From the very beginning, we treated him as an integral member of the team in everything from technical to financial with an eye towards building a long term, win-win relationship between the two companies. Bill Albright Who knew we had an Industrial Design major in our midst? We knew that Bill, who goes as “biL” from Wooden Pistons Design, was a pretty creative fellow (middle school art teacher, metal worker, bobber builder). But when we asked him to share a few thoughts on making sure the KickMagic parts fit in to the style of a Triumph, all of a sudden he had 10 of us huddled around a Google search screen looking at images of “futurism” as he gave examples and advice on how to make everything fit and look like it belonged on the bike. His piece-de-resistance is the prototype satchel which he made by hand. Rick S. Another aerospace engineer and biker who worked with Nick and Jack “back in the day”, Rick is an engineer’s engineer. Acting as another avuncular adult in the room, Rick was always the perfect guy to ask “what do you think about this approach?” or, “what material do you think we should make this out of?” His first British bike was a 71 Triumph 650, so things had come full circle when we asked if he would build up an endurance test rig that happened to be a, wait for it, 71 650! John Shook John had the “good” fortune of owning a ’76 Bonnie that he was working on in the shop during the same time period as the KickMagic development. For the team it meant three things. 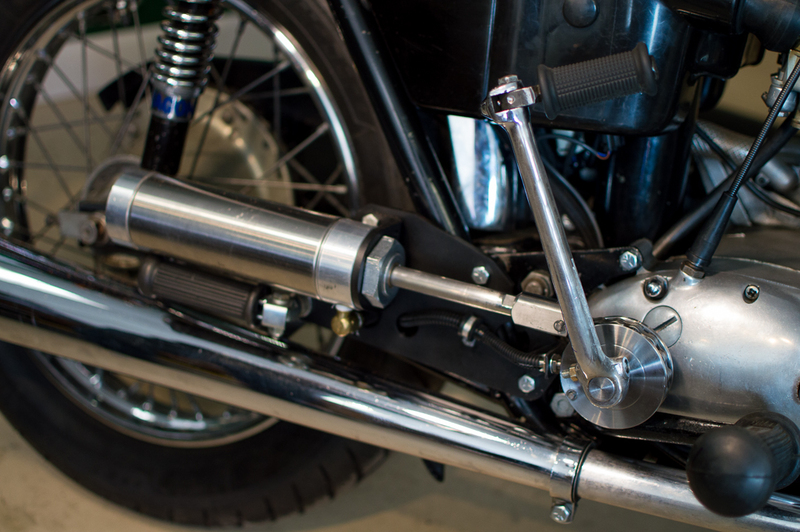 First, the bike is a left hand shift and so a good example for them to study as our base bike was a ’73 and a right hand shift. Second, he represented the perfect voice of the customer. A long time rider and very passionate about his Triumph, he was to the point in his riding career that kick starting and concern about kick backs were limiting his ability to fully enjoy the bike. Which, brings us to the all-important third point – he is our first “official” customer! Sue and Doug Edwards Sue worked with Jack’s mom at a weekly newspaper in Massachusetts back in the day as a graphic artist and layout specialist among other things. She gets credit for bringing the CBE and KickMagic logos to life in a clean and professional form. 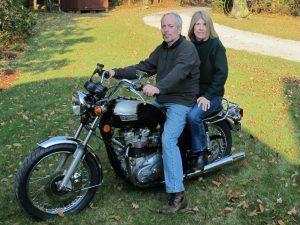 Doug, also an aerospace engineer, has been a Brit biker most of his life and currently has a 78 Bonnie that he worked at CBE several years ago. Like Sag, we consider him a senior advisor as our approach and detailed design evolved. If Doug was quiet, you knew you probably missed the mark. If he gave it a thumbs up, you likely had nailed it. We got both kinds of feedback as we went along, but in the end, he gave us two thumbs heading in the right direction! Shyam, Roshan and Govind These three musketeers put together some awesome videos during our engineering development phase that we could share with trusted advisors and potential customers. They were entertaining, but serious and really drove home the point that KickMagic is “So easy a kid can do it”. We look forward to putting together more videos with this cast in the future. Paul Tingaud Paul stopped by the shop one day to let us know he was an experienced machinist who had worked on a wide range of high performance automotive programs and was setting up his own shop under the title of “Supercar Machining.” Next thing we knew, he was machining all of our prototype parts, working and consulting elbow-to -elbow with the SEED team, and now has been helping on a wide range of other CBE machining needs. A great, local resource who added a lot to the design process. Steve Kastner Owner of DesignWise Studios. You are clicking around this website thanks to Steve’s efforts. 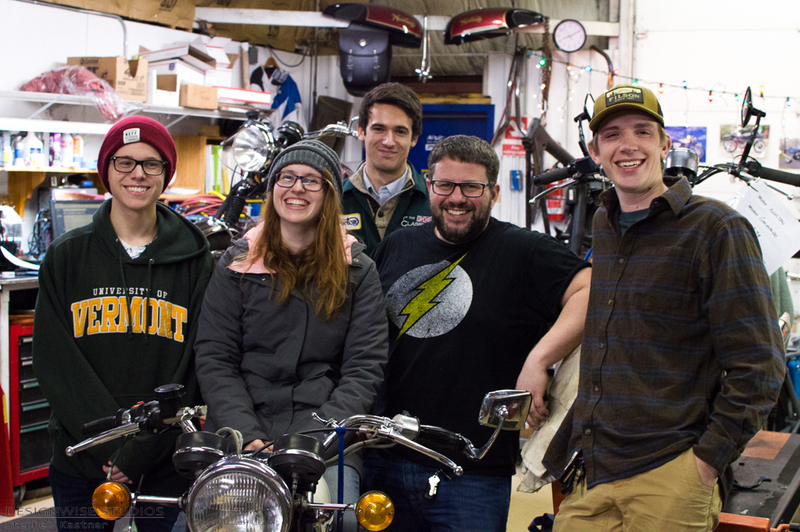 He came to Vermont from Sturgeon Bay, Wisconsin in the fall of 2016 and just happened by the shop. Before long, he had his GS1000 Suzuki in residence and was taking over the CBE website, Facebook account, and anything else we needed to promote the shop. When KickMagic started to take form, he jumped in as our go-to guy on the sales and marketing strategy and, of course, has done this site. He is a very, very cool dude with awesome life stories. An incredible resource and friend! Paul Zuniga Owner of Born Again Bikes in Laredo Texas is the artist behind the 68 Triumph line drawing used in our logo. Subha Luck And last, but certainly not least, is Jack’s beloved wife Subha (who, along with Nick and Jack, are the owners of CBE and KickMagic LLC’s). 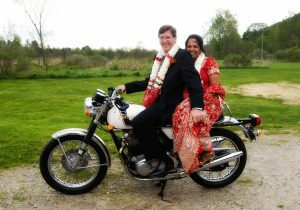 Jack and Subha were both widowed and by some form of magic found each other in 2007 and married in 2008. Her first time over for dinner was in the company of not one, but two, Norton Commandos in the dining room. You can’t say she didn’t know what she was getting in to! She has unwaveringly supported the whole 10 year journey that has been CBE and now has seen the beginning of the next generation in the form of KickMagic.